Office 365 Message Encryption (Information Rights Management) - To use Office 365 Message Encryption, the sender must have Office 365 Message Encryption, which is included in the O365 E3 license. With the new Office update, email encryption in Outlook got better. The Permissions button is replaced with the Encrypt button . The new Encrypt button contains both encryption options (S/MIME and IRM). The S/MIME option is only visible if you have S/MIME certificate configured in Outlook. 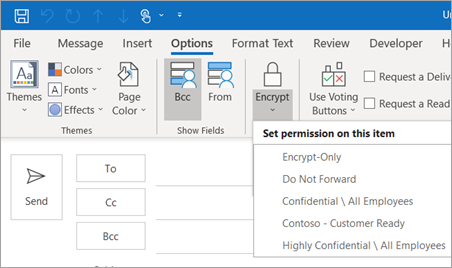 For detailed instructions on adding encryption check Encrypting with S/MIME or Encrypt with Office 365 Message Encryption. Before you start this procedure, you must first have added a certificate to the keychain on your computer. Once you have your signing certificate set up on your computer, you'll need to configure it in Outlook. Under the File menu, select Options > Trust Center > Trust Center Settings. In the left pane, select Email Security. Under Encrypted email, choose Settings. Under Certificates and Algorithms, click Chooseand select the S/MIME certificate. You'll see an Encrypt with S/MIME if you have an S/MIME certificate installed on your computer. In an email message, choose Options, select Permissions. Finish composing your email and then choose Send. In an email message, choose Options, select Encrypt and pick the encryption that has the restrictions you want to enforce, such as Encrypt-Only or Do Not Forward. Note: Office 365 Message Encryption is part of the O365 E3 license. Additionally, the Encrypt-Only feature (the option under the Encrypt button) is only enabled for subscribers (Office ProPlus users) that also use Exchange Online. In an email message, select Options > Permissions and pick the encryption option that has the restrictions you'd like to enforce, such as Do Not Forward. In the message that you're composing, on the Options tab, in the More Options group, click the dialog box launcher in the lower-right corner. When you choose to encrypt all outgoing messages by default, you can write and send messages the same as you do with any other messages. All potential recipients, however, must have your digital ID to decode or view those messages. On the File tab, click Options > Trust Center > Trust Center Settings. On the E-mail Security tab, under Encrypted e-mail, select the Encrypt contents and attachments for outgoing messages check box. In the message, on the Message tab, in the Options group on the ribbon, click the Encrypt Message Contents and Attachments button . Note: If you don't see this button, click the Options Dialog Box Launcher in the lower-right corner of the group to open the Message Options dialog box. Click the Security Settings button, and in the Security Properties dialog box, select Encrypt message contents and attachments. Click OK, and then close the Message Options dialog box. Compose your message and send it. Choosing to encrypt all outgoing messages means, in effect, your e-mail is encrypted by default. You can write and send messages the same as with any other e-mail messages, but all potential recipients must have your digital ID to decode your messages. On the Tools menu, click Trust Center, and then click E-mail Security. Under Encrypted e-mail, select the Encrypt contents and attachments for outgoing messages check box. Note: 3DES is the default encryption algorithm used in Outlook 2007. For more information, see the Overview of certificates and cryptographic e-mail messaging in Outlook.